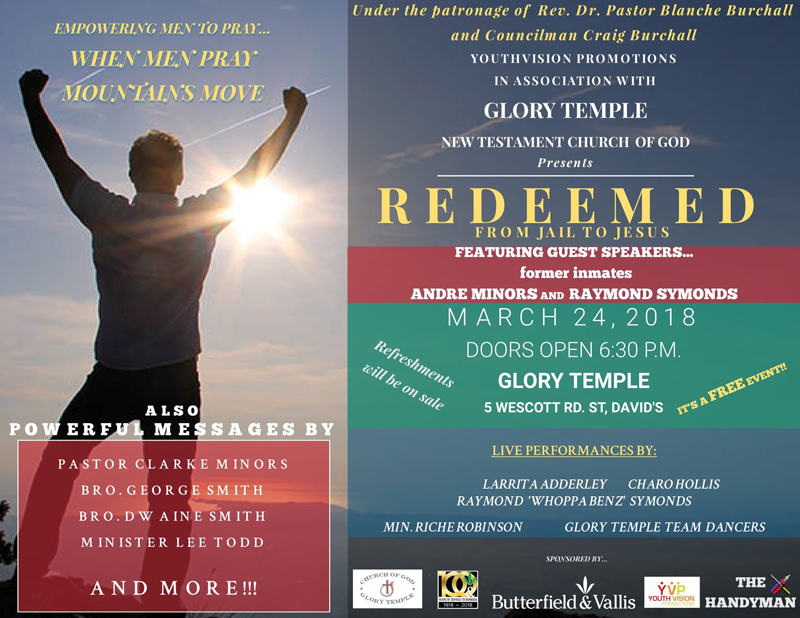 YouthVision Promotions in association with Glory Temple New Testament Church is getting set to present their next anti-violence event “Redeemed: From Jail to Jesus” on Saturday, March 24 at Glory Temple New Testament Church. Youth Vision’s Desmond Crockwell said, “This event will include former inmates Raymond Symonds and Andre’ Minors. “Raymond served three of a ten-year sentence for he smuggling Drugs in Bermuda. He gave his life to God while incarcerated and now Raymond writes and sings music for the Lord. He is passionate about helping others to make smart decisions and is more than willing to share the consequences of foolish actions. “Sentenced to 16 years [reduce to 11 years on appeal], Andre understands the transition from Jail to Jesus was the most important decision he could have ever made. He is intensely devoted to spreading the good news of God and the impact that being around the right people can have. “This extraordinary and life-changing event will also feature entertainment from well-known former Bermuda Idol winner Larritta Adderly, Gospel Artist Charro Hollis, The Glory Temple Team Dancers, and Minister Riche’ Robinson. “As well as the entertainment, there will be powerful inspirational messages from Bro. George Smith, Minister Lee Todd, Pastor Dwain Smith and others. “It is our belief that Spiritual Intervention can save lives, and cause one to changing their focus. It is our hope that Christians and non- Christians can come out and build a vision to commit to helping our at-risk young people, as it really does take a community to raise a child. “Our events fuel up the community’s desire to get involved. For more information, please contact 337-7786 or 595-8261.
yah: Exactly!We are getting tired of all this Burt, not a lot of Easter Cheer in my house.